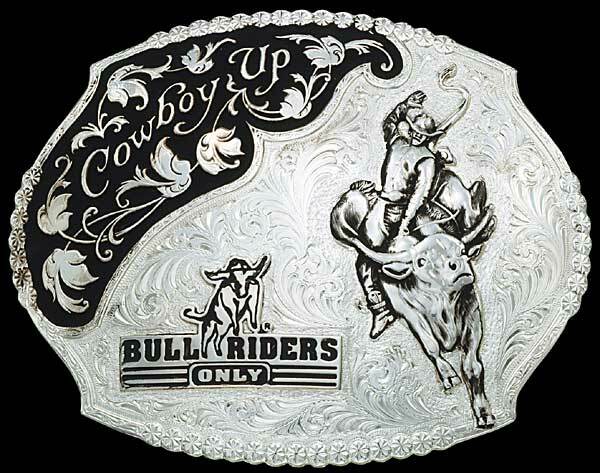 Bull Riders Only / Cowboy Up Belt Buckle by Montana Silversmiths. 3 3/4" x 4 7/8" buckle features a bull rider figure in a powerful, head-on perspective, "Bull Riders Only" and "Cowboy Up". Available in an antiqued, all silver finish or two-tone (silver with gold). One of our most popular cowboy belt buckles. Ships in 1 - 14 days. Click image above to enlarge. The electroplate finish of Montana Silversmiths belt buckles -- including the Bull Riders Only / Cowboy Up belt buckle -- simply won't tarnish. All Montana Silversmiths belt buckles have a lifetime guarantee against defects and workmanship. They are die-struck from hand engraved masters, finished with silver and gold electroplate and state-of-the-art Montana Armor® tarnish protection. "I was totally impressed with the followup customer service emails that kept me posted on the status of my purchase. The quality of the item was impeccable. I would definately shop from them again."